So I read this book a long time ago and now I am finally doing a review. So this may not be as in depth as any of my other reviews but I hope you still enjoy this. I loved this book! At first I was hesitant on reading it because it seemed too similar to The Darkest Minds by Alexandra Bracken WHICH I LOVE BY THE WAY IF YOU DIDNT KNOW!! But this was a completely different story. It was a completely different type of cast of characters. I have always enjoyed Marie Lu's writing and this was no exception. She really created a group of well-rounded characters and I enjoyed every character's part-take in the story. It was a really cool concept and it was done really well. I thoroughly enjoyed the setting of the story and the plot was at a good and constant pace. I am very excited to continue on with the series! All in all this was a great book and I give it a 5 out of 5 yellow star rating! Today I will be sharing with you what I am currently reading. So I am not extremely excited by reading this book, it is kind of a filler book after The Crown's Game. This is because I haven't had the best run with Lauren Oliver's books. But so many people like this book and I have had it for so long. There is only so many books left on my TBR and if I am not to like some book after reading an amazing one, might as well be one that I probably won't love anyways. Do you guys get what I am saying. I think it sounds like a load of gibberish. But I do hope that I actually really like it and I get through it really fast! 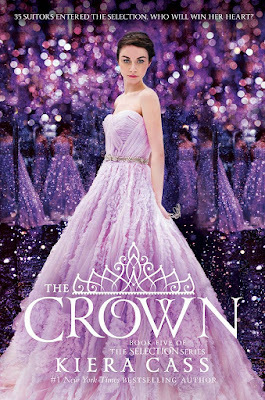 Today I will be review The Crown's Game by Evelyn Skye. Today I will be sharing with you a giveaway that I stumbled upon. This giveaway is by Clean Teen Publishing and Crimson Tree Publishing and it is for a kindle fire and 10 digital books. To enter this giveaway you can go to cleanteenpublishing.com/contests/ and enter! Good luck to everyone else entering the giveaway! This is just a reminder to enter the writing competition that is hosted by myself and Kierra from whattoreadwriteseeanddo.blogspot.com (Go check out her blog for some other cool stuff). The contest is running until July 31st, so make sure that you enter! For more info on the contest go to my earlier post CLICK HERE. If you would like to enter the contest, you can click HERE and fill out the Google Form! We are very excited by the contest, and we already have entries coming in! But don't worry! With all of the categories, EVERYBODY HAS A CHANCE! Remember! You will be recognized on both websites for all viewers to see! This includes PUBLISHERS, AGENTS, AND AUTHORS that visit the sites. There is no guarantee that a publisher, agent or author viewing the site will pick up your writing, but there is a VERY HIGH CHANCE! SO MAKE SURE YOU ENTER!!!!! Today I will be sharing with you a reading update. As you guys may know by my previous posts, I had gone camping and while camping a I read many books in one sitting, this was a glorious achievement. But I forgot about the backlash of reading like that. The problem with me is that if I read nonstop and go very fast, at some point I am going to hit a wall. I hit that wall while reading Falling Kingdoms by Morgan Rhodes. So now I am in a bit of a reading slump. Don't worry it isn't too bad, and I will be uploading frequently. I just have the slump. So I am hoping that the quick and easy book that I am reading right now, The Young Elites by Marie Lu is going to get me out of that slump. And remember when I said that I wasn't reading The Young Elites because it seemed too much like The Darkest Minds? Well it is very different. A totally different style and the characters and the basis are so different. I am highly enjoying it so far! I hope you liked this fun little thing, I always love seeing these and relating to them, I hope you related to them too! Today I will be telling you what I am Currently Reading! I haven't actually started this book, but I am going to today. I put-off reading this book because the plot seems very similar to The Darkest Minds, which you should know is one of my favorite books. But many people like it so I hope I do too! Hey guys! Today I will be reviewing Falling Kingdoms by Morgan Rhodes. So let's get into the review.